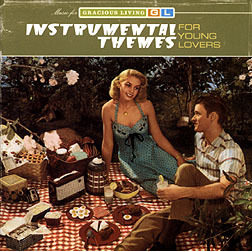 CD Review: Various Schmaltzy Artists, "Instrumental Themes for Young Lovers"
The problem with any retro music compilation is that you're never quite sure if you're getting an accurate musical overview of the era in question. Consider the possibility that thirty years from now there will be a 90's compilation entitled Never Sell Out: The Story of Alternative Music and it will feature such underground luminaries as Four Non-Blondes and Hanson. The jacket touts Instrumental Themes... as a showcase of "artists who helped raise these sides above the level of purely functional schmaltz." Well, OK, but it's still schmaltz -- this is the kind of muzak they were still piping into department stores well into the mid-seventies. This is what Paul McCartney had in mind when he said "as long as it doesn't sound like Mantovani" when George Martin first suggested strings for "Yesterday." The usual suspects are here -- Percy Faith, Ferrante & Teicher, Andre Previn -- and it general it reminds one of some of the incidental muzak from Animal House. Not that it's all a trip down amnesia lane; you may actually find yourself digging tracks like Andre Kostelantz's "What is This Thing Called Love?" and Joe Harnell's "Cast Your Fate to the Wind." Dave Grusin's "The More I See You," though, will probably have you thinking about buying a Nissan, in its own subliminal way.